Another week, another burger review. As the search continues, we repaid a visit to one of only two of 2014’s 5 star burgers. Now for those of you who have spent your good time perusing our humble website, we are sure it will come to no surprise to you when we say we are fans of the fine freehouse known as the Lamplighter (for those new to the site, take a look at our full Lamplighter review here). The reason we are writing today however is not to sing the praises of the pub’s extensive beer options, traditional setting or impeccable Sunday roast; we are searching for burgers. Not just any burgers, but burgers that take the very simple concept of a piece of meat resting in-between two pieces of bread and transform it to something out of this world. 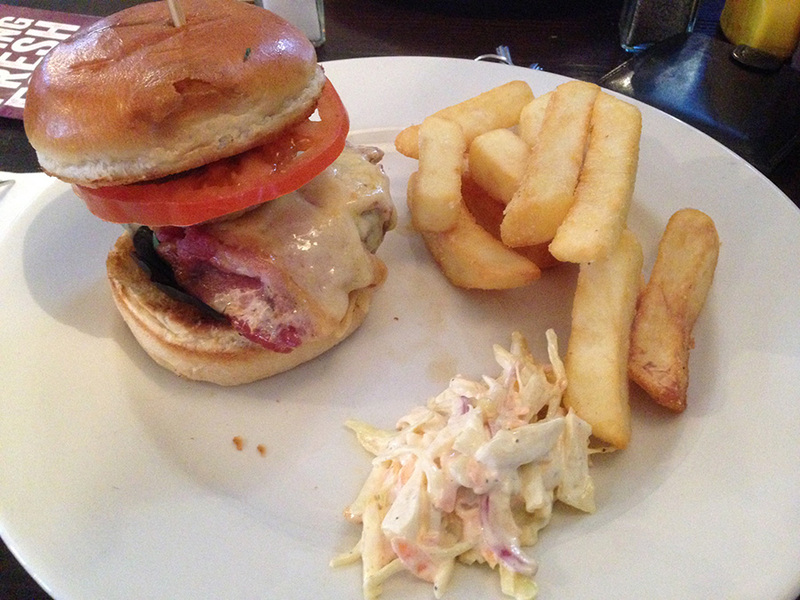 Having achieved such a feat with 2014’s BBQ Beef Burger, we returned to see if the Lamplighter could do the same again in 2015. The menu was the same, would the outcome be as well? Now we now what you are thinking; that is not an inspiring picture – especially when compared with the burger of 2014. Being burger professionals however and remembering the quality burger that the Lamplighter served us in the past, we were still optimistic the poor presentation was a ruse to hide all the great flavour. As the saying goes, never judge a book by its cover. The presentation in this case however was not an attempt to deceive us before blowing us away with something of utter joy. In this case, the cover was very telling of the book. So where do we start? As it is the most important element of any burger – and probably the most redeeming feature of what we were served – we will start with the beef. The high quality beef used by the Lamplighter was well seasoned, just as we had expected; unfortunately the patty was too thick and slightly dry without the juiciness, tenderness or rich beefy goodness. As we chewed away, our first thought was more sauce was needed to contend with the beef. Then we remembered we had ordered the BBQ beef burger. We were expecting a smothering oft of sweet, smokey, slightly spicy BBQ flavour to be bombarding our palette. Unfortunately the paltry amount of sauce applied to the top of the bun made us think that the chef had decided to reinstate the rationing of the 40s. There was barely enough to add a level of moisture or flavour to the affair. We were almost insulted that it was called a BBQ beef burger. It seems the word of the day was soggy as well. As we picked up the burger, the bottom bun of the bread was soft and doughy, leaving our fingerprints embedded in as it struggle to contain its contents. The cold onion rings also fell into this moist trap, with a soggy and rather unappetising batter – something which is unforgivable given that we expect our onion rings crispy and adding a crunch if they are to be added to a burger. The bacon was undercooked whilst the thick layer of melted cheese made the burger quite greasy. The two combined simply created a stringy mess. The only discernible crunch came from the three slices of gherkins found inside the burger, which coincidentally, is the only element of the burger we could not pick fault with. Things turned from bad to much, much worse when we opened our burger up to inspect what was happening inside and found one, lone, dead and blackened ‘mixed leaf’ clinging onto our beef. It did take the team a minute to determine what it was after peeling it off the burger. Even if the burger had managed to fail on the majority of the elements, we thought that perhaps the accompanying accoutrement might have offered some silver linings. We thought wrong. The handful of chips served were so undercooked that when we broke a chip in half, we thought we heard a snap. The coleslaw, whilst perfectly edible, lacked any distinctive flavour and was simply bland. Lacklustre, sloppy, disappointing; take your pick. 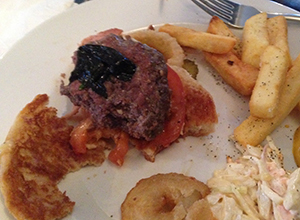 The burger served to us in the Lamplighter was a clear representation on a plate of a chef in the kitchen that paid very little attention and very little care regarding what was served. The presentation was telling, but we had not imagined so many simple elements were done poorly. The balance was all wrong, with far too much cheese combined with the stringy bacon, soggy bread & onion rings, thick beef tomato. The undercooked chips was lazy; the dab of BBQ sauce applied to the burger was almost laughable and worst of all was the cremated leaf covering our burger. A saving grace was that the beef was good quality, however the preparation and cooking did it no justice. There was plenty of arguing between the Northampton Gent team regarding what star rating should be given, with many arguing that the limp, dead leaf was enough to warrant us awarding our first ever 1 star review! It was however the quality of the beef that ever so slightly managed tip a second star. The real issue here is consistency, and we never expected to ever be writing this about a former burger champ. It seems in a rather dramatic turn of events, whilst the Charles Bradlaugh underwent an incredible transformation to go from 2 stars to a extremely high 4 stars in 12 months, the Lamplighter has unfortunately managed to drop 3 stars. We hope the former 5 star burger stars can turn it around for our 2016 search.